Picture a world where nuclear bombs do what no villains could ever manage--our heroes are all killed off, save one, who was tired of being hunted. His intelligence and strength are second only to his hatred of humanity. He is the Maestro, and in this brilliantly drawn post- apocalyptic future, he rules all. The Maestro has one weak link to his past, the man who created him. That man finds the one person who can help, Dr. Robert Bruce Banner, currently incarnated as the Professor version of the Incredible Hulk (though at this time, of course, he thinks he is a merging of Banner and the Hulk). Peter David takes "our" Hulk face to face with a possible version of himself, and he doesn't like it one bit. Initially he tries his fists but they're no match for an older, meaner, ruthless version of himself. Soon he is, in all senses in the world, trapped in time. As the Maestro tries to turn the Hulk, another plot is afoot, but it, too, fails. 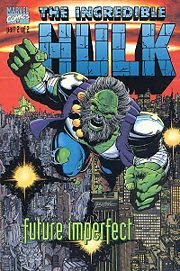 To win, the Hulk must use his brain instead of his brawn and return himself to his very beginnings in order to have a chance to win. This is the dark side of David and Perez, with ruthless death, sexual innuendo, and other themes that would have been edgy for the time. Marvel gave them a pass with one of their most popular characters and it worked brilliantly. You'll find all the patented Peter David humor, and all the patented George Perez details, wrapped in an amazing story. Worth getting for the treasure room scene alone, this one offers so much more. It's a great read.